At GeoWize we serve a wide variety of industries in many capacities. Whether you are looking for a locations for your business, more information about your customers and ways to target them, or competitive intelligence, we can help. Starting a new business is tough. GeoWize provides numerous resources to help you succeed. Small businesses start up almost every day. The number of small business start-ups that actually succeed are around only 5%. Many times the failure is caused by what we call the “Field of dreams syndrome”: “Build it and they will come.” Unfortunately, businesses almost never succeed following this approach. GeoWize will provide you with the data and information you need to be successful. Starting up a new franchise branch location is the same as starting a new business, and it can be tough. The difference between starting your own business and a franchise branch location is the amount of support the franchiser provides. GeoWize will provide you with the market and competitive intelligence you need to be a successful franchise owner. When a small business achieves success, one of the next steps in their growth plan is expansion. One proven method for expansion is franchising. Franchisors have a number of business requirements that can best be addressed by GIS. GeoWize has a long record of supporting franchisors with GIS analysis and data. GeoWize will help you support your expansion to ensure success. The Economic Gardening movement is expanding and growing every day as economic development organizations discover how powerful and effective the EG approach is. GeoWize is certified by the NCEG as a GIS EG specialist, and a founding member of the NCEG’s National Strategic Research Team. GeoWize will support your economic development organization’s GIS needs. Commercial Realtors are under pressure to list and sell properties. By understanding the area’s supply and demand landscape they can identify which types of businesses to attract to a specific location, and they can support the prospects ability to succeed at the site with hard data. Additionally, when representing a buyer, they can provide them with GIS data that shows the best areas to look for potentially successful sites. GeoWize will support you in finding the best possible location for your client businesses. Marketing and advertising companies have a need to support their clients in understanding their market and their customers. The marketing and advertising campaigns that these companies provide to their clients are based on a solid understanding of their client’s customers. GeoWize provides the detailed market analysis and customer profiles that marketing and advertising firms use to support their clients. 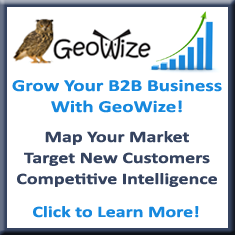 GeoWize will help you target the customers that your clients are seeking. Most artists are not business people, their art comes first, and being in a “business” is an afterthought. Artists need to view themselves and their art as a business to be successful. GeoWize will provide the artist with the market insight and resources they need to become a successful business person.